Curated by Sophie Behal & Maeve Lynch. 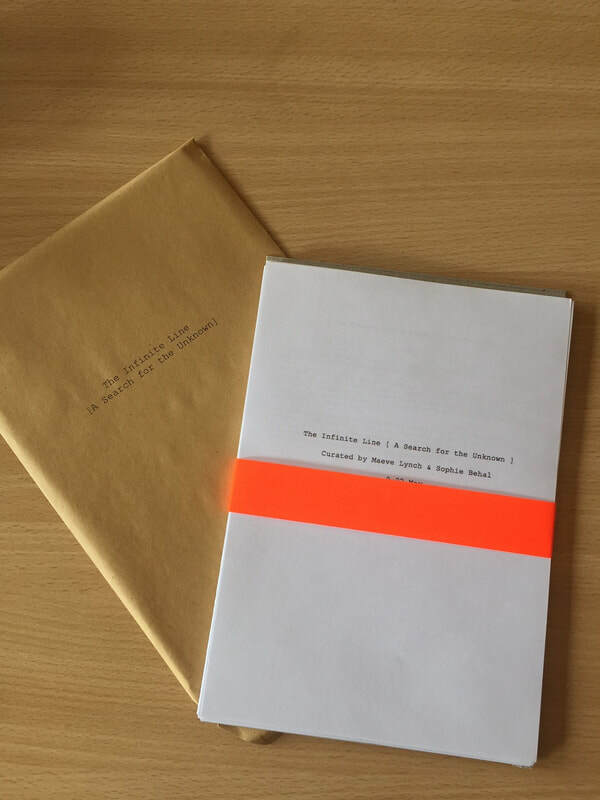 The Infinite Line [ A Search for the Unknown ] is an exhibition of new artworks by Roseanne Lynch, Richard Forrest and Cassandra Eustace, accompanied by a once-off performance piece by Fergus Byrne. The artists work loosely through the medium of drawing in the tri-dimensions and with the experiential qualities of light. This is translated through sculpture, photography, drawing and installation. 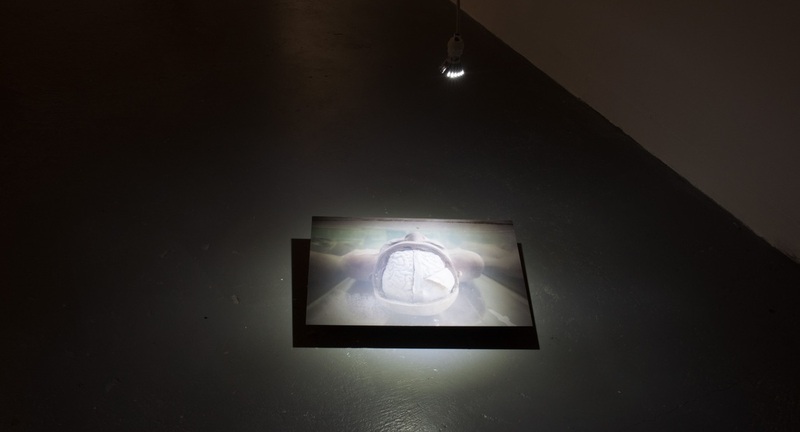 This show takes as its genesis ideas of spatial and temporal slippage and the unknown. 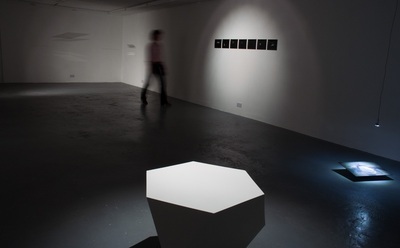 The work explores the unknown from the angles of art, physics and architecture and look at their relationship to philosophical ideas of perception. Our knowing is through our individual perception of things and of our surroundings. Ultimately not knowing is the only thing that we can be certain of. This exhibition questions the things beyond our understanding and the nature of knowledge itself. It deals with knowledge as an unstable ground and precarious truth. In association with the exhibition there is a publication on A Search for the Unknown with commissioned texts by Poet Physicist Noel Duffy The Line of the Known and Unknown and Artist Tracy Hanna. Sophie Behal & Maeve Lynch both hold First Class Honours Degrees from the CIT Crawford College of Art and Design (CCAD), having graduated in 2012. As well as working independently as practicing artists they regularly collaborate on publications, curation and one-off events. Cassandra Eustace completed her MA, in Art and Process through CIT CCAD in 2013.She graduated with a First Class Honours Degree in Fine Art in 2012 from CIT CCAD and was awarded Student of the Year. Her recent solo exhibition ‘Of Light and Structure' was shown at the James Barry Exhibition Centre, CIT. Roseanne Lynch completed her Masters by Research in 2010 through CIT CCAD. Her work has been exhibited nationally and internationally. She received the inaugural Alliance Francaise Photography Laureate Award in 2011. Roseanne lectures in Photography at CIT CCAD and at Cork Centre for Architectural Education (CCAE). She is represented by Mark St.John Ellis, of nag Gallery, Dublin. She has just been awarded a 2-year artist residency at CCAE. Richard Forrest, born 1988, is a practicing artist based in Dublin. Forrest graduated in 2011 with a First Class Honours Degree from CIT CCAD. For his exhibition in the 2011 Degree Show he was awarded numerous prizes of note. Forrest has exhibited throughout Ireland in numerous group shows that include: The Black Mariah, Cork, Catalyst Arts Centre, Belfast, Tactic Gallery, Cork, Occupy Space, Limerick, SOMA Contemporary, Waterford, The Crawford Art Gallery, Cork. He recently had a well-received solo show in The Joinery, Dublin and was shortlisted for the Siamsa Tire Emerging Artist Award. Fergus Byrne is an artist working in performance and visual arts. He is a member of the Visual Arts Centre in Dublin. His practice involves video, drawing, sculpture, writing and performance. For this durational performance, Byrne will engage in a focused period of dance with mobile wooden frame sculptures. Balance and imperceptible movement are his current areas of exploration with these sculptures. The result of combining body and frames will be a mutual engagement whereby his movements are influenced by the wood and vice versa. Recent projects include; Galway dance Days Corp-Real Symposium, Weave; Improvisation and community, Brussels, Headin’ Out with Tallaght Community Arts, No Less than the Trees and The Stars choreographed by Becky Reilly and Generation,which he curated at The Dock, Carrick on Shannon. 1. 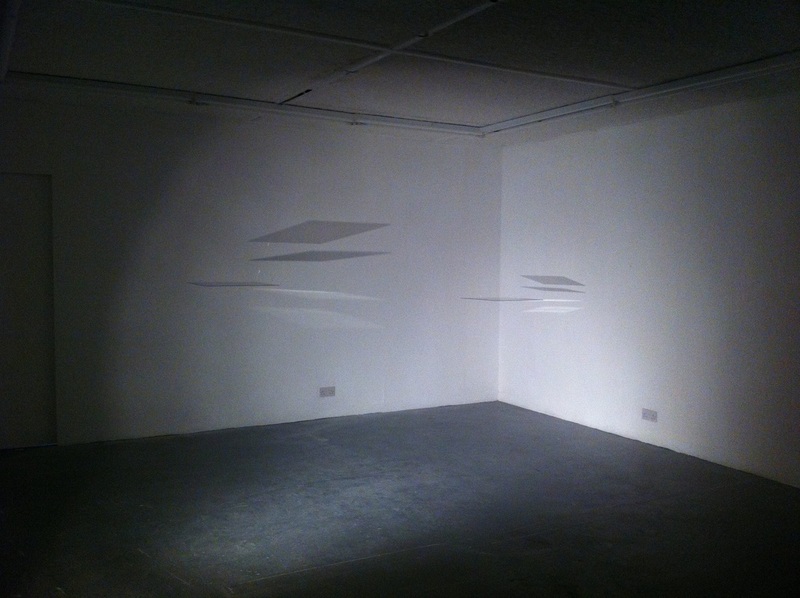 Installation Shot of The Infinite Line [A Search for the Unknown], TACTIC Gallery Cork L-R background Cassandra Eustace , Roseanne Lynch, foreground Richard Forrest. 3. Cassandra Eustace, L-R Imperfect Patterns II, Unrepeatable Difference, pen & ink on tri-acetate & carbon paper drawing on tri-acetate. 5. Richard Forrest, Fractal Structure, photograph mounted on diabond. ﻿7. Fergus Byrne Performing on the opening night. 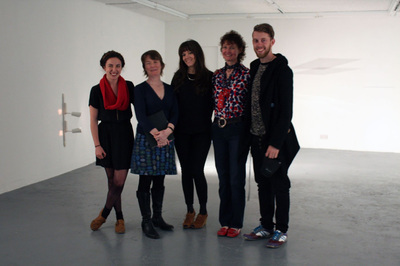 Tactic Gallery, Cork City: 9th-22nd May, 2014. Keats was, of course, referring in those last lines to that towering figure of science Isaac Newton and how, for him, the rainbow demonstrated the reflection and refraction of light through moisture in the atmosphere to reveal the full glory of the visible spectrum. For Keats, such a description of this natural phenomenon robbed it of its former mystery, reducing it to mere explanation. It should be said, of course, that Romanticism was, in many ways, a retreat from 18th century rationalism and the rise in elevation of the importance of science during that era. Romantics such as Keats built their founding philosophy on the notion that it was more important to write of the feeling generated by encountering nature in all its wonder rather than by simply setting out to measure it by “rule and line”. However, the Romantics, by raising our experience of nature to the level of pure emotion, robbed it, in turn, of its necessary ambiguity and sometimes harsh modalities. Perhaps it is most surprising then, that it was that pillar of Victorian taste, Alfred, Lord Tennyson, who first recognized that such an ecstatic view of nature (or ‘the pathetic fallacy’ as the critic John Ruskin also spoke of) didn’t quite coincide with the reality that presented itself to our discerning eye. He was right to be disturbed in what he saw as “nature red in tooth and claw.” We could no longer view the natural world as being there to serve us: it is indifferent to what we think of it and functions by its own laws. Clearly, this shift in perspective caused great shock, as well as the intellectual necessity to engage with an awareness of Charles Darwin’s Theory of Evolution as it grew ever more prominent. With the rise of modernism in the early 20th century artists made a clear and abrupt fracture with the past and some of the quaint notion discussed above, striving instead for an accuracy of perception, which the American poet Wallace Stevens described as an “accuracy with respect to the structure of reality”. While all modernists were preoccupied with this notion, the interpretation of what this meant was often quite varied and even divergent. For Ezra Pound, the unit of such a reality was the Image, a truer basis he believed for art to build itself upon over the neat rhetorical devices and tidiness of old current (Edwardian) forms. T.S. Eliot took this further with explorations of fractured psychological states, recorded in works (such as The Wasteland) that shift from one fragmentary experience to another, searching for some form of order in the confusion of experience. And for others, like Stevens (again), reality was the product of the imagination as it encounters and, in turn, shapes the world. Only with this form of imaginative and constant engagement, he argued, could the dynamic order of the universe be revealed. These are hardly notions of accuracy that a scientist would recognise, even those faced by the New Physics of General Relativity or Quantum Mechanics in the opening decades of the 20thcentury. The “rule and line” of art was still a somewhat different enterprise than that of the caliper and telescope. But we may come to the question as artists: What are we being accurate toward in the end: the objective facts of the world, or our experience of being in that world? In recent times, we have come increasingly to think of accuracy as being synonymous with the precise, reproducible certainties of scientific truth, with Stephen Hawking stating lately that “science has made philosophy redundant”. One wonders what he thinks of the contribution of the arts to human knowledge. The great search, now, in science is for what is popularly called a Theory of Everything. It is a deeply important undertaking and, should it ever be achieved, would be of unimaginable significance, both for science and society. Having said that, should we not challenge such a grand – if not grandiose – term, the Theory ofEverything. It seems to take a limited view of what we mean by that all encompassing word. Such an explanation would, in the end, simply be one of the material universe and the aspects of that universe described by physics alone. It wouldn’t help us decipher the genome, for example, or indeed, the untangle the nature of consciousness. As such, it would ultimately have very little to say about the experience of living; that deeply subjective narrative in which we live out each of our lives. For me, science is not just a steady procession of unassailable facts, produced dispassionately by purely rational means. It is also a process of trial and error, instinct and hunches, driven often by profound curiosity. The story of the history of our understanding of light itself, demonstrates this point well. 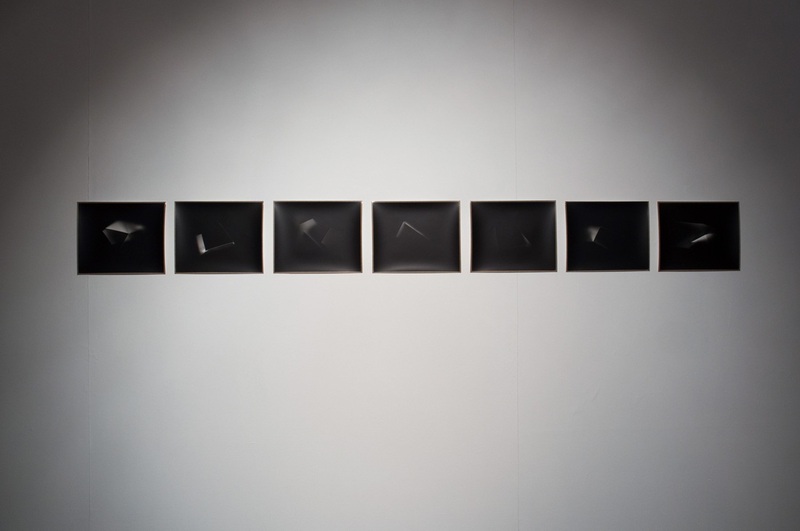 Perception is so crucial to living everyday life as we all know yet, when used more precisely, it can become also an instrument of scientific inquiry as well as artistic scrutiny, as the three artists in this exhibit demonstrate in very different ways. But we cannot have perception without light and our ideas about light has had a long and interesting history. The standard version tells us that in antiquity, Plato among others, proposed what is called the ‘Emission Theory’, arguing that light travelled from the eye to the object it perceived in a direct line. We clearly now know this to be wrong. What may come as a surprise was how long Emission Theory persisted, but also that it wasn’t, in fact, that giant Newton (again) who first overthrew it, though this is taken as the standard narrative in the history of science. No, this notion of light was proposed six centuries earlier by the Persian scholar Ibn Al-Haytham (popularly known as Alhazen) who conducted a series of experiments on light while under house arrest, proving irrefutably that light travels in straight lines from the object of observation to the eye, demonstrating this fact by creating (most probably the first) camera obscura in his small room by placing a heavy black curtain across it and making a small aperture at its centre, the rooftops and spiking minarets of Cairo projected upside down onto the wall opposite. It is this last detail - upside-down - that proves the assertion. Alhazen also first explained refraction, reflection, spherical aberration and the magnifying power of lenses, though sadly little if his work and findings were disseminated in Europe, and Newton certainly wasn’t aware of his forerunner. This is not to reduce Newton’s claim also on these ideas and he was, indeed, the first to explain the spectrum of light that Keats found so anathema to his sensibility and feeling for the natural world. For me, this history alone becomes a fascination in itself. It reminds us that science doesn’t always proceed linearly and is, in the end, also a very human undertaking. In short, there is a story to science that goes beyond a mere ledger of facts and falsities. And where then does art stand in such a schema? It’s hard to know what possible direct function it may provide to science, at least within the realms of its own methodology. Some would say, I’m sure, it has nothing to offer at all. And for art’s part, does science unweave the rainbow as Keats’ suggested and rob nature of its direct power over our imaginations? Can artists exploit the insights of science and yet bestow on it to the quality of imaginative encounter? I think it is fair to argue that while science offers no criticism of the arts, it also offers no real meaningful place for it in its own enterprise and perhaps this is at the peril of potential hubris. It is certain in recent years, that there is a kind of slippage going on in science towards an attitude of all-knowingness – or, at least a quest and belief to reach such a point in the future. However, it does sometimes seem that this quest is pursued at the expense of (and respect for) other modes of knowledge such as art, myth and experience itself, furtively moving towards a general disenchantment through explanation, both in terms of the natural world and our place within it. This then, inevitably leads to the question: what is arts relationship to science and can it have a meaningful discourse with it? I think we have to be clear here and say that the arts and the sciences serve different, though no less important, functions. Science’s job is to examine disparate phenomena and find a law or theory that shows how they are connected. This hypothesis is then tested and if proven true gives us an ‘objective’ truth. Art also tries to find patterns of connections and draw unexpected material together to form a coherent work, but it can never aspire to the empiricism of science, nor should it. In the end, a poem or any art-work can only persuade rather than prove. It captures something of the ‘subjective’ experience of living (even as it wrestles, at times, with abstraction), though by means that make such an experience recognisable or comprehensible to another person. We might borrow an important concept from science and call this a form of ‘resonance’. I would suggest that art that engages with scientific ideas helps us to explore and see (in a sense) both the wonder and insight that science has provided us with and in the process we may humanise such ‘objective’ knowledge as we try weave it into the fabric of lived experience. Art is uniquely placed to help us to make sense of our relationship to it, as well as asking the question: how do you live in such a world with such knowledge? A poem, for example, can be said to exist in a fictional space. Yet, it is accurate of something. The truth of imagination is just as important as the bare nature of the facts. The places we create in the imagination feel just as real as the concrete places we inhabit in our lives, yet imaginative accuracy is judged, as such, by a different set of criteria than the scientific connotation of that word. It deals with the contradictory nature of our inner lives, not just the outer one. 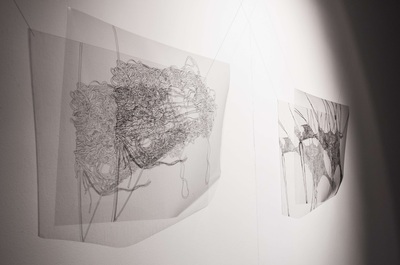 And perhaps by creating work that draws on science, as in this exhibit, we – as artists in different forms – are attempting, through such an engagement, to bring these seemingly abstract and even distant ideas into some form of imaginative resonance, so that they too may form part of the fabric of our reality in the process; that such ‘ideas’ may also be experienced as well as understood. Science brings us new and deep knowledge of how the universe functions through theory and law, but as human beings we have a deep desire and need to feel connected to both place and our place within it. It seems to me that science does not unweave the rainbow as Keats suggested all those years ago, but offers us both new knowledge and perspectives regarding nature that artists can examine and engage with at the level of the imagination as well as the cerebral cortex; and that in doing so, the two disciplines can create a meaningful exchange of perspectives and a balanced view of life, one that is accurate to the facts but also, crucially, felt.